Angelo Iovine first appears at Painesville, Lake County, Ohio, in 1909. When he immigrated to the United States Painesville, Ohio, was his destination. He was 15 years old. Angelo was escorted to America by his father, Leonardo Iovine. In America Angelo Iovine was known Angelo Iovine. Angelo Iovine, son of Leonardo Iovine and Domenica DiCristofaro, was born on July 29, 1893, at Castelnuovo, Isernia Province, Molise, Italy. He married Maria Colarusso about 1920. Angelo died on January 15, 1977, at Lake County Memorial Hospital, Painesville, Lake County, Ohio, at age 83. His body was interred at Riverside Cemetery at Painesville, Lake County, Ohio. Angelo Iovine first immigrated to the United States on March 23, 1909, at age 15. He was travelling to Painesville, Lake County, Ohio. Angelo was travelling with his father, Leonardo Iovine. Leonardro was returning to Painesville. They were joining Angelo’s uncle, Bartolomeo Colavecchio, in Painesville. Angelo and Leonardo arrived in the United States at the Port of New York City aboard the ship SS Ancona. Angelo Iovine was enumerated for the 1910 Census of the United States, on April 25, 1910, living at Paine Avenue, Painesville, Lake County, Ohio, as a brother-in-law of Francesco Preziuso. Angelo Iovine was enumerated as Andrew Lervold. Francesco Preziuso was married to Angelo’s sister, Maria Assunta Iovine. Angelo registered for the military draft for World War One on June 5, 1917. He was living at 223 Storrs Street, Painesville, Lake County, Ohio. He was employed by the Diamond Alkali Company. Mr. Iovine served in the United States Army during World War I.
Angelo Iovine, his wife, Maria Colarusso, and their son, Leonard Iovine, returned to Italy in 1921 or 1922. Angelo Iovine is cited on a passenger ship manifest re-entering the United States on February 11, 1923, at age 29. He was travelling to 223 Henry Street, Painesville, Lake County, Ohio. He entered the United States at the Port of New York City aboard the ship SS Giulio Cesare. Maria and Angelo had children born at Frosolone, Italy, in the fall of 1925 and fall of 1927. So Angelo must have returned to Frosolone by late 1924. Angelo Iovine is cited on a passenger ship manifest re-entering the United States on June 18, 1927, at age 33. He was travelling to 400 Storrs Street, Painesville, Lake County, Ohio. He entered the United States at the Port of New York City aboard the ship SS Roma. Angelo Iovine’s wife and three children immigrated to the United States in 1929. They joined him in Painesville, Ohio. Angelo Iovine was enumerated for the 1940 Census of the United States, on April 06, 1940, living at 125 Prospect Street, Painesville, Lake County, Ohio, as a head of household. Angelo Iovine was enumerated as Angelo Iovine. 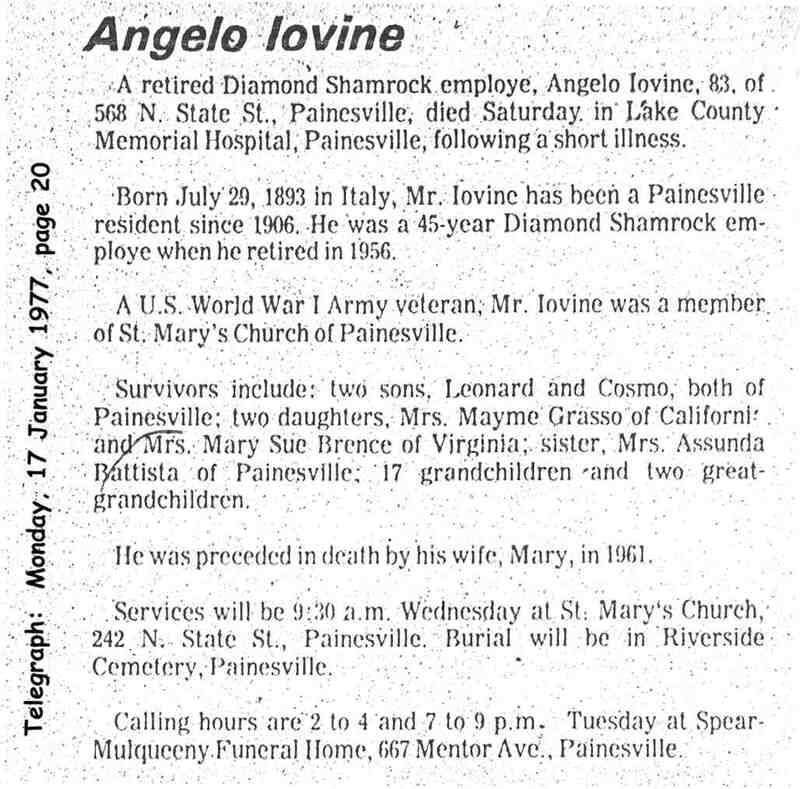 Angelo Iovine was widowed by the death of his wife, Maria Colarusso, on August 7, 1968, at Painesville, Lake County, Ohio. Mr. Iovine was employed by the Storrs and Harrison Nursery Company for a couple of years after he came to America. He started working at the Diamond Alkali Company in 1911. He retired in 1956, after 45 years of service.